Easypromos enables you to run contests and giveaways for all users who like or comment on a Facebook Page post. The "Facebook Giveaway" application allows you to import participants’ information with a single click. It also helps you to implement rules and exclude specific users from the giveaway. 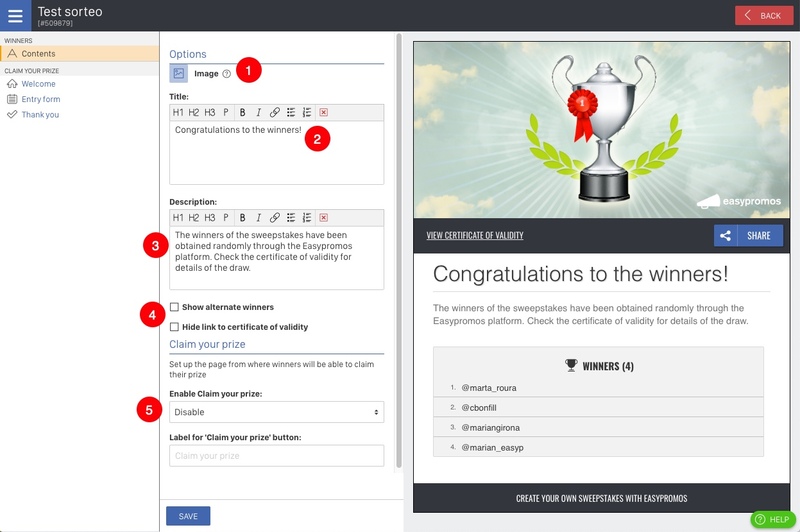 Once the contest is over, you can customize a special page for announcing the prizewinners. You’ll be able to display a certificate of validity, showing that the competition is transparent and trustworthy. You’ll find access to a tool for writing and publishing a giveaway post in your Easypromos Control Panel. The first Facebook Giveaway is free and it allows you to run a giveaway with unlimited participants (among users who comment on the post or "like" the post). Basic plan ($29 / 29€ month): it allows to run unlimited giveaways with a maximum of 5,000 participants. Basic PRO plan ($49 / 49€ month): it allows to run unlimited giveaways with unlimited participants. Check our comparative table of prices to know all the details of the prices and limits for the Facebook Giveaway. The first step is to publish a post announcing the contest on Facebook. Write and publish it just as you would with any other post. Haven’t you created the post yet? Check out our ready-made templates with text and images for the giveaway post and publish your giveaway in just two clicks. Access the Easypromos Control Panel via this link. If you’re not a user yet, you must create an account first. You’ll be able to create and manage your promotions from the Control Panel. A) Your account information is located in the top right bar. Use your account ID (preceded by the # symbol) to identify yourself when requesting help from the Support Center. B) You’ll see three tabs, dividing your promotions into three categories: Active Promotions, Draft Promotions, and Old Promotions. Once the deadline to participate in the giveaway is over, the next step is to import the giveaway post to your control panel in order to retrieve all the participants. 1. Click "Create New Promotion" to start setting up the giveaway. Note: The possibility of selecting more than one post for the same giveaway is not available for the first free giveaway. Accounts with the Basic plan have the possibility of selecting a maximum of 10 posts for the same giveaway. In addition, with the "Multi-Network Giveaway" application you can add up to a maximum of 25 posts for the same giveaway. 9. By clicking on the "Continue" button, the import of the comments of the posts you have selected will begin. Note: Do you want to run a giveaway combining different social networks? With our application “Multi-Network Giveaway” you can carry out a prize draw including users who participate on posts from more than one social network: Facebook, Instagram, Twitter and YouTube. See how it works! If you imported the giveaway post to your dashboard days ago, the new comments that the users have left in the publication will not be automatically imported into your dashboard. In order for these new comments to be retrieved, you must update the list of participants prior to finalizing the draw. To do this, before advancing to the next step and finalizing the draw, click on the "Update now" button that you will find right next to the number of participants in your giveaway. When you click the button, you will see that the system imports all the new comments that the users have made on the Facebook post and will add them as participants in the giveaway. You’re now on the open Giveaway page. Beneath the title, you’ll see the number of participants and the options to view and export participants’ data. From here you can also exclude participants or send them to a blacklist. Note: Exporting the list of participants to an Excel file is a feature available only for Easypromos accounts with a Basic plan or higher. Alert! 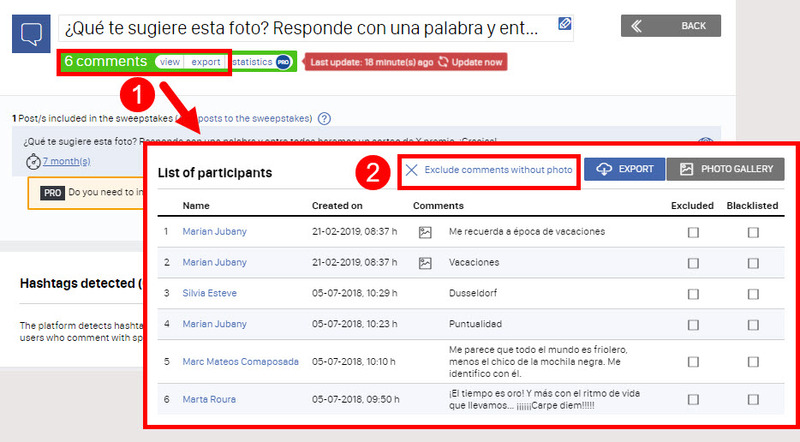 In the case of "likes-reactions" giveaways and comments with hashtags, the tool presents the entries grouped according to the reactions/hashtags detected. This classification is preconfigured as informative, although if the administrators want to, they can use it as a filter and only the participants with the selected hashtags or reactions enter the final draw. 1. Add any users engaging in bad practices to your blacklist. This will exclude them from all your Facebook Giveaways, so you don’t have to exclude them manually each time. The blacklist is linked to your Easypromos Administrator Account, so it will be permanently available to you. 2. Exclusion of previous winners. Select this option if you don’t want users to be able to win more than one giveaway from your account. 3. One-off exclusion. If you only wish to exclude a user from one particular giveaway because they have broken the rules, use this search tool to find and exclude the user manually. You can also find them in the list of participants. 4. Exclusion based on hashtags in comments. This option is available when participants include hashtags in their comments. For example, when you’ve used the tool for running a giveaway with specific hashtags and comments. We explain more about this option here. 5. Exclusion entries registered after a certain date. 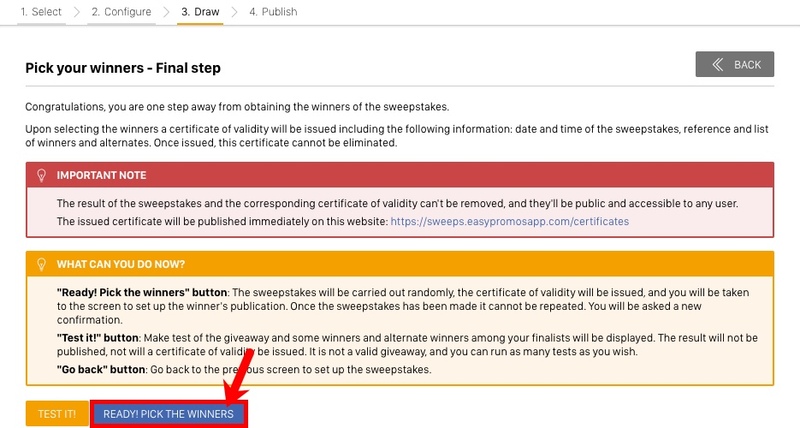 In case of comments giveaway, this option allows you to indicate the closing date of the giveaway so that users who participated after this date are not entered into the final draw. We explain more about this option here. 6. Exclude users who have not commented on the minimum number of posts. 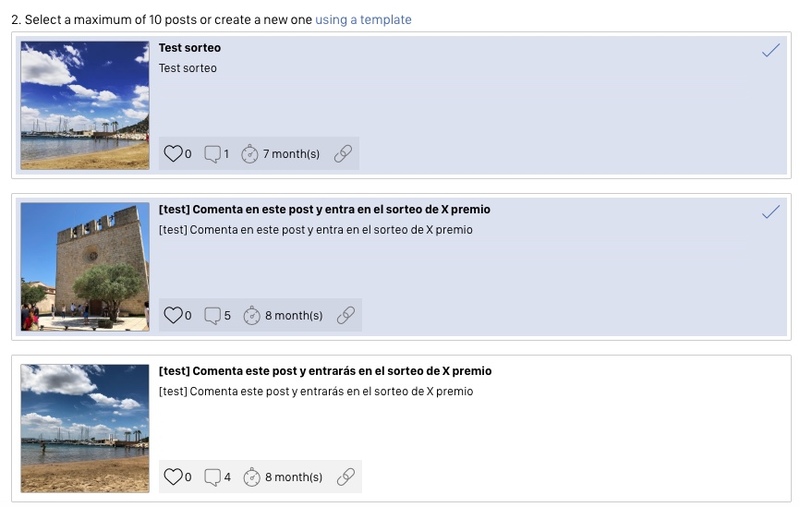 If it is a giveaway among users who have commented on several posts, this option allows you to limit the giveaway to users who have commented on a minimum number of posts. We explain more about this option here. 7. Exclude users with a minimum number of characters in comments. If it is a comments giveaway, this option will allow you to filter participants so that those who have included a minimum number of characters in their comment can enter the giveaway. 8. Exclusion of users that haven’t included a photo in their comment. This option is only available for comments giveaways, and it allows you to filter users that have not included a photo in their comments. Automatically exclude users without a photo. Users who have not uploaded any photos in their comment will not be included in the list of finalists. Photo gallery. You can view all the photos uploaded by users in the comments of the post in gallery mode. This enables you to check the photos uploaded by users in a very visual and dynamic way and control the content of the images. 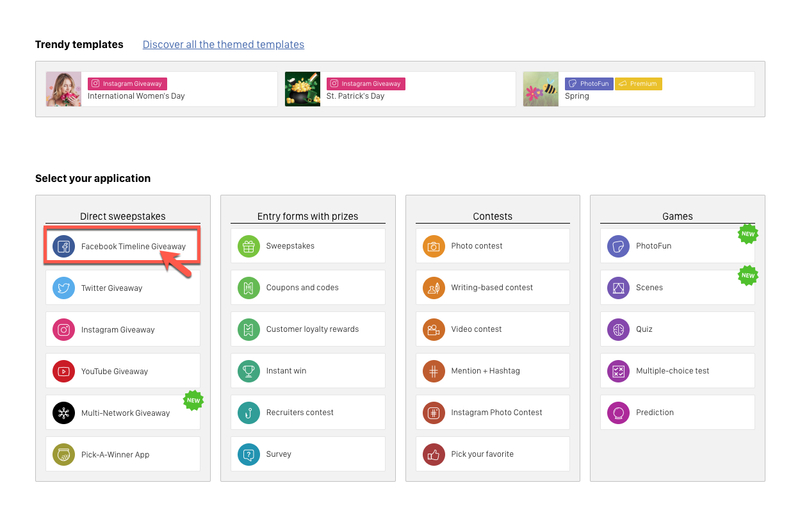 In addition, for more control over the finalists of the contest, you have the option to exclude images that don't meet requirements with a single click. In order to allow users to include a photo in their comment, remember to set up your Facebook page with the option "Allow visitors to the Page to publish posts". You'll also need to enable the option "Allow photo and video posts". You can check this configuration by accessing your Facebook page in Settings> General> Visitor Posts. Otherwise, users will be able to comment on the giveaway post, but they won’t be able to include an image. Next, you should indicate how many winners and alternate winners you want to select. We always recommend including alternate winners, as they can make it easier for you to distribute the prizes. Note: the total number of winners and alternates must be maximum 1,000. Do you want to give away different prizes? With the option "Customize the prizes" you can create all the prizes you want to give away, and for each prize, you can define the number of winners you want to obtain. You can, for example, have a first prize to give away movie tickets to 2 winners, and a second prize of tickets for a concert to 2 other winners. 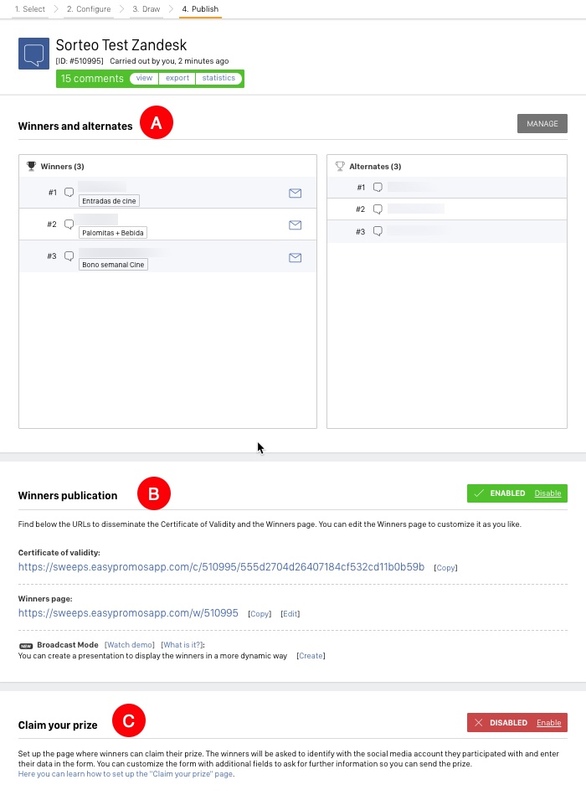 Being two different prizes, this option will allow you to manage the number of winners you want to obtain for each type of prize, and at the time of publishing the winners, these will also be presented separately. Before activating the random selection of winners, you'll have a chance to carry out a test to help you learn how the tool works. Note: The possibility of carrying out a test is not available for the first free giveaway. When you are ready to pick a winner, the system will allow you to finalize the giveaway and see the winners and alternate winners. If you don’t have an active Basic plan, the system will offer you the chance to purchase it. Once you have an active Basic plan, and you're ready to pick your winners, click the "Ready! Pick the winners” button and winners will be selected randomly. Once the giveaway has been finalized, it can’t be repeated. Finally, a window will open with a summary of the configuration of your giveaway, which you must confirm in order to continue with the process. In addition, you have the possibility to activate the option "View the random draw as an animated presentation", which will allow you to visualize the winner selection process in the form of an animated presentation. See an example here. Congratulations! The giveaway has been carried out and the results will be displayed. You can now think about announcing the winners and awarding the prizes. Here you'll see the list of winners and alternates. You can manage the prize winners from this page, and replace them if needed. Certificate of Validity. The Certificate of Validity confirms that the giveaway has been run once only and completely at random. 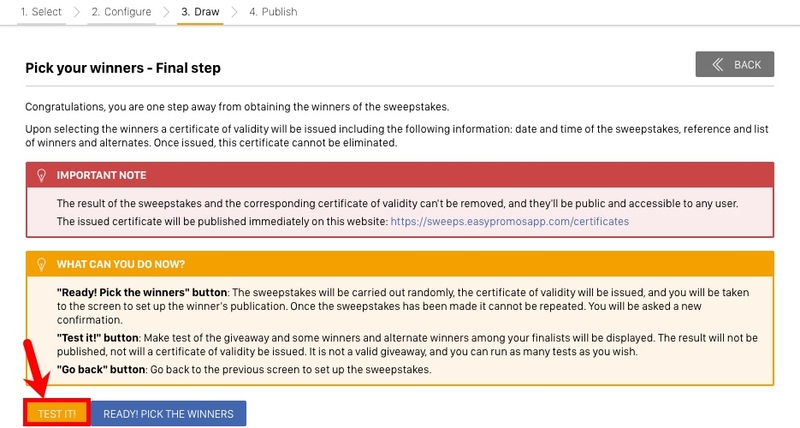 This certificate identifies the giveaway and it can't be modified. Share the URL with winners so that participants can see that your giveaway was run fairly and transparently. Winners Page. This is a microsite where the names of the winners and the alternate winners are displayed. This way, communicating the results will be easier. You can customize this page to adapt it to your brand and needs. Broadcast mode. This option allows you to present the results of the giveaway in an animated format to show the winners in a more fun way and add a point of surprise and fun to your draws. This option is only available with the Basic PRO plan or higher. More information. Do you want the winners to be able to send you their data and claim their prize? You can set up and activate this section to aid in the prize-awarding process. This way, users who visit the Winners Page will be able to claim the prize on their screens, verifying their details and confirming that they're interested in receiving their prize. To enable it, click on the "Enable" button and follow the steps indicated in this tutorial to customize all module options. When the Winners Page is ready, share it on social media. 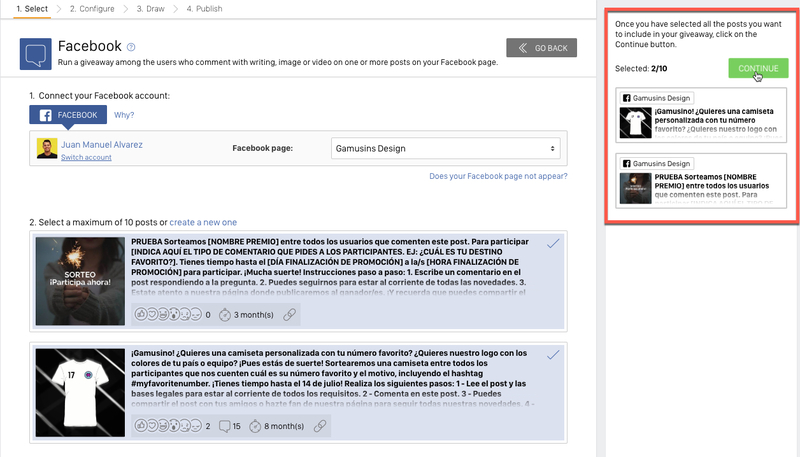 You can use the "Share" button or copy and share the URL of the Winners Page directly. If it is a comments giveaway, you can send a message to the user's comment that has been selected and tell them that they have won the giveaway. See whether winners have claimed their prize, and review the details they've provided. Manage the prizewinners and replace them if necessary. Download all the information provided by prizewinners in a file. How can I carry out a Giveaway from multiple posts on my Facebook Page? How can I exclude users who’ve participated late from a comment-based giveaway? How can I use hashtags in comments in my Facebook Post giveaway? How can I notify winners of a Comment-Based Facebook giveaway? I’ve randomly selected the contest winners. How can I repeat the Sweepstakes? Why do I have to select at least one alternate?